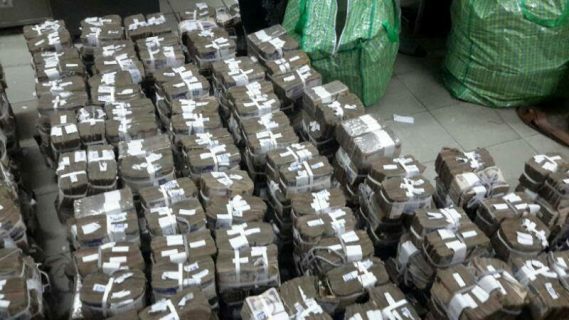 Justice Rilwan Aikawa of the Federal High Court in Lagos has ordered the final forfeiture of the sum of N449,597,000 found in an abandoned Bureau de Change shop in Victoria Island, Lagos by the Economic and Financial Crimes Commission EFCC on April 8th. Justice Aikawa gave the order for permanent forfeiture after no one came forward to claim ownership of the money. The judge had on April 19th granted an order for the interim forfeiture of the money pending when anyone would come forward to claim it. EFCC hand approached the court for an order for the forfeiture of the money after a respondent in the case, Mohammed Tauheed, failed to come forward to claim the money. Counsel for the EFCC, Idris Mohammed, told the judge that the interim order of April 19 had been advertised in the newspaper on May 11, so as to bring the case to the notice of Tauheed any interested party. However neither Tauheed nor any other person come forward to claim the money. Delivering judgment on the application for permanent forfeiture, Justice Aikawa said “This court ordered, among others, the respondent (Tauheed) and any other interested party to show cause, within 14 days, why the interim forfeiture of N449,597,000 should not be made final. As far as my record shows, neither the respondent nor any other interested party has filed any affidavit or any other process to show cause why the interim order should not be made final.